Check out our new products! 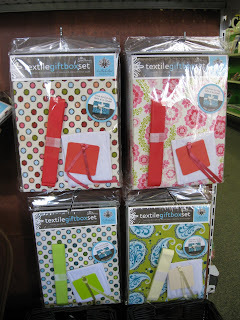 One of our favorites is the "textile gift box set" which includes a fabric wrapped box, gift tag, lots of ribbon, and tissue paper! Everything is color coordinated with darling modern prints. They come in small and medium for $4.99 and $5.99. It is so nice to be able to pick up ONE simple package and have ALL you need to wrap a gift in style! Your gift will totally stand out in the crowd. Plus, if you recieve a Hullabaloo box, you can reuse it for storage or another gift! The other product we carry are baskets and interchangeable basket liners. These are great for decorating with, organizing, storing, or gifting! 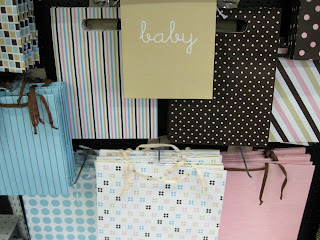 We just got the CUTEST baby gift wrap in! All of it is themed in pink/brown, or blue/brown - so hip! Most all of it works as wrap for any occasion - not just baby. There is matching tissue paper, ribbon, bags, wrap, and bows! This is a scrapbook company that has started a giftwrap line - which is awesome 'cause you get all those fun prints! Now don't you think half the fun of giving a gift is the wrapping? It definitely makes the gift about 15 times better if it looks nice when you give it!